India got its freedom in 1947, while Daman which connects Maharashtra with Gujarat declared as ‘Union Territory’ is taken care by central government now, was still under Portugal till 1960’s. In those decades people needed permissions and visa stuff to enter cities like Mumbai and other states. It was a Indo-Portuguese time when this little village which is surrounded by the famous old fort in Moti Daman was having limited population. The fort has complete residence within, Now some government offices too. Today, Daman is known by its two locations ‘MOTI DAMAN’ which is old one which has this huge famous fort and Jampore beach. While ‘NANI DAMAN’ is the new developed city and preferred residential location with lots of accommodation options like Hotels, Resorts for tourists along the famous Devka Beach. Since Daman is a Union Territory, taxes are very less on Liquors, Definitely a reason to attract lots of foreign tourist and local citizens of Mumbai and Gujarat who enjoy beach side drinking freedom and stay. Cost of a Beer in Daman is Rs.60 Compared to Rs.90 to 120 in a regular beer/wine shop of Mumbai, Wow that makes it a great place to eat drinking and sleep away from hustle bustle of city, that too without restrictions of drinking on beaches and all around. One more small attraction place for new tourists i should not miss to mention here, It is a Jetty in Moti Daman quite near to the main market junction,a beautiful evening place to enjoy cool fresh breeze with fishing boats around, along a small not well maintained old fort to sit enjoy your time, Yes you can have your drinks here below wide open sky. Recommended and best time to visit here is between November and January, Holidays and Special festive seasons like HOLI celebration etc. Both these beaches are very crowded throughout the day and late nights. The old and famous beach as compared to Jambore, as already said located in Nani Daman which has lots of stay options like Hotels and Resorts connected to Beach, Few with great sea view to enjoy your leisure time with friends, family and love. Cost of hotels per day / overnight depends on Season, Holidays and Off season time. The main season is said to be Winter, somewhere around November, December and January. Devka also attracts many visitors during summer as its a famous one day and over night picnic spot. Our tourism video below taken at beach side shows those hotels and resorts connected to beach. For kids their is a small garden connected, Not so well maintained but still good for fun and play time, Entry fee for same is Rs.5 per person. Enjoy the little khatta mitha Bore, Green Mango with Salt, and Rose Apple (Jambu) during pre-summer days. Their is a small Daman tourism board that helps guide the new tourists for sightseeing options etc. The crowd seen in the below video is due to the Holi festive day, People specially travel Devka to enjoy and have full fun of this festival of colours day along the beach. For safety during such festive days beaches are under police observation. Their are tall green coconuts and other trees at sea side, a great option to enjoy your picnic during summer to sit and play and save yourself from from beach heat. Small eateries stalls here are seen selling packed food like biscuits, chips and nuts, coconut water, tea etc throughout the day because of famous tourism demand always. Although safe to dive in and with good water current, Devka beach water is comparatively muddy with tiny stones seen at shore. 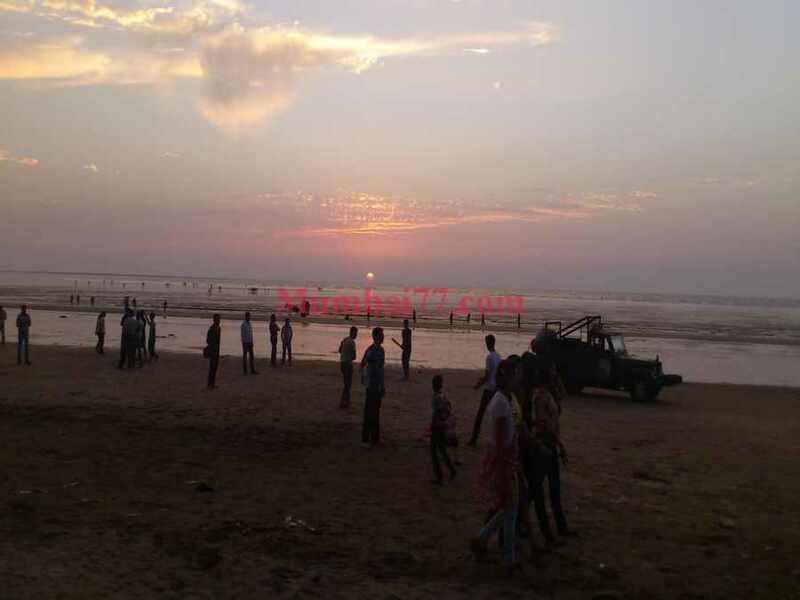 This is one of the preferred beach for Gujarat residents staying at locations like Vapi and Valsad. Ample space for parking is available and its a safe beach for overnight stay too. Personally, i like this beach more compared to Devka which is at some 2 to 4 km distance. Jampore is not so famous as hardly any Hotels and Resorts around and being in Old Daman, But how does that matters to those who are here for one day picnic, or those staying just couple of kilometers in hotels at Nani Daman ? Nothing. This is one of best beaches near Mumbai, very safe when it comes to water currents and swimming inside, I personally saw this beach during low tides when water was far inside, Surface is flat and safe and not deep and dangerous for swim. Checkout the below video of Jampore beach and surroundings which shows picnic groups, families, friends enjoying horse and camel ride and the very adventurous Para-sailing. Much cleaner and more wider, the complete stretch of this beach is seen at a glance, a beautiful sunset view and nice seating arrangements with shades at shore at every few distance is what i liked. One of the main attractions of this beach is Para-sailing Adventure, Which takes you as high as those coconut and other trees and you can watch complete surrounding beach feeling free and flying in sky enjoying cool breeze, See the video below. One without private vehicle might feel reaching this beach little tiring as Auto’s and Taxi’s are not very frequent here. During non festive days or on weekdays, Non-Holidays this beach is all vacant and serene, Yet safe for couples and others too who are here for picnic etc. Their are plenty of Hotels, Resorts, Villas and Cottages available near beach (AC and Non-AC). Below we try giving you a rough idea on rates with hotel names. A video below may help you with a live view of such resorts and hotels. Kindly note that below are approximate cost (in Rupees) for Hotels near Devka beach and rates may differ with time and season and also during weekends and weekdays. By Road : People of Mumbai have 2 options to reach Daman, By Road it is about 181 km from proper city, taking about 2 and half hours on average to reach here. Take Mumbai Ahmadabad National Highway 8 and follow the signal boards. Remember VAPI sign board and its very easy then. Check out the road distance and map for more details. By Train : From Dadar or Bandra, Borivali or Virar take passenger train towards Gujarat which halts at Vapi, Get down in WEST and their is regular Auto, Taxi Options. Share taxi cost from vapi station to Daman will be about Rs.20 Per person. Total of 5 people are taken in one taxi to cover the travel cost of Rs.120 for a trip, Which means hiring a private taxi will take somewhere between Rs.100 to Rs.120. If you take a fast train, it takes about 2 hours travel from Mumbai.